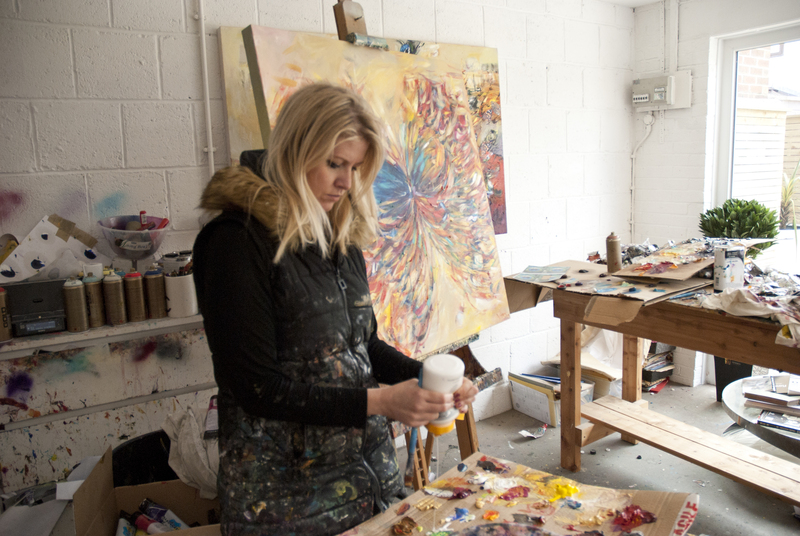 Today we’re taking you into the studio of Victoria Horkan – a talented British painter whose works boast a vibrant colour palette, allusions to creatures of the sea and sky and expressive strokes that encourage each viewer to make emotional connections. From listening to music to overcoming self doubt to winding down with the help of her canine companions, Horkan’s days are decorated with plenty of colour. It’s time to spend one with her! Good morning, Victoria! What’s the first thing you do when you wake up in the morning? I make a strong cup of coffee! Sets me up for the day, that and probably a few more along the way! I think when you have a passion for something, it’s part of you and you just have to do it. Like how a performer needs to perform. I have so much going on in my mind in terms of painting, creativity and ideas I think I would burst if I didn’t work. Colour is like therapy for me. When I’ve had a short break from my work, I never really relax because my mind is always thinking creatively. When that stops, I’m in trouble. I have a large studio at the back at my house, with lots of glass doors and an abundance of light. It was immaculate for the first week of having it renovated, now I am afraid it’s a complete mess. Chaotic, colourful, paint splodges on the floor, and my easel is thick with layers of oil paint. I don’t think I could paint with someone else in my little haven of joy. There’s something about being able to shut yourself away from the world for a little, away from social media etc., and just get lost in a world you control. Victoria Horkan hard at work in her studio. I like to think I’ve created a 3D like effect within my work that’s completely unique, and I think this why I have a growing number of collectors who admire this technique. I prefer not to divulge how I do it, but a lot of it just comes from that passion I spoke of earlier – and a good palette knife! 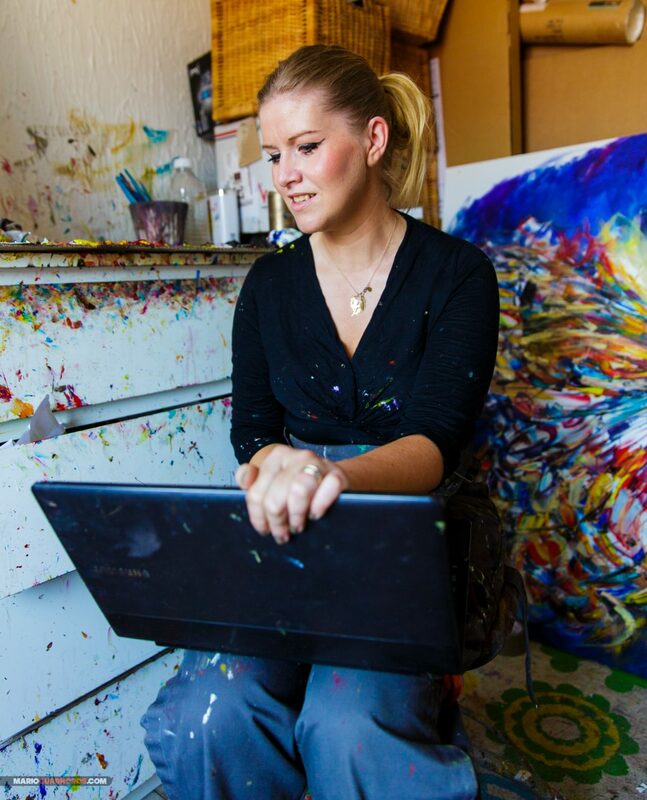 My work is expressive, extremely textured and has an energetic feel: positive and uplifting, I hope! Oh gosh yes – music is very important. I think painting and the symphony between art and music is key. 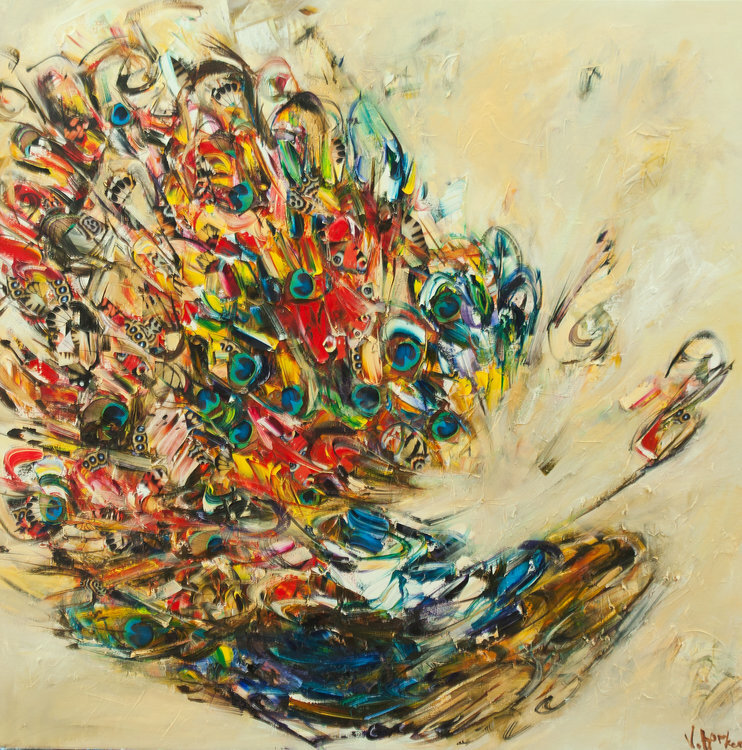 I think it adds to the feeling of each painting; swaying motions, or emphatic sweeping gestures are all enhanced and brought to the forefront when a good song is playing in the background. Victoria Horkan ‘The Tempest,’ 2018. 100x100cm, Oil on canvas. When it stops niggling away at me. Like a note that’s off key, it will just bug you until it’s right. That’s about the artist’s standards I guess, and what they believe is technically right and balanced, etc. I take my dogs out for a nice long walk, make something nice for dinner (I treat that a bit like a painting) and then watch a bit of TV. Getting to the end! Everyone makes the assumption that artists are super happy because we’ve got the dream job and our creative process is easy. After years of doing this, I can tell you it isn’t. I realised only in this past year that happiness only really comes in and hits you at that point where you are happy with the piece, and this is usually at the end. The journey is usually a struggle of self-doubt and uncertainty: Is this good enough? Will it turn out alright? Will someone want to buy it? So I’d say 90% of the time you’re finding your way; it’s only at the end when you can tell yourself ‘I’ve created a good piece’ and feel that ultimate reward. 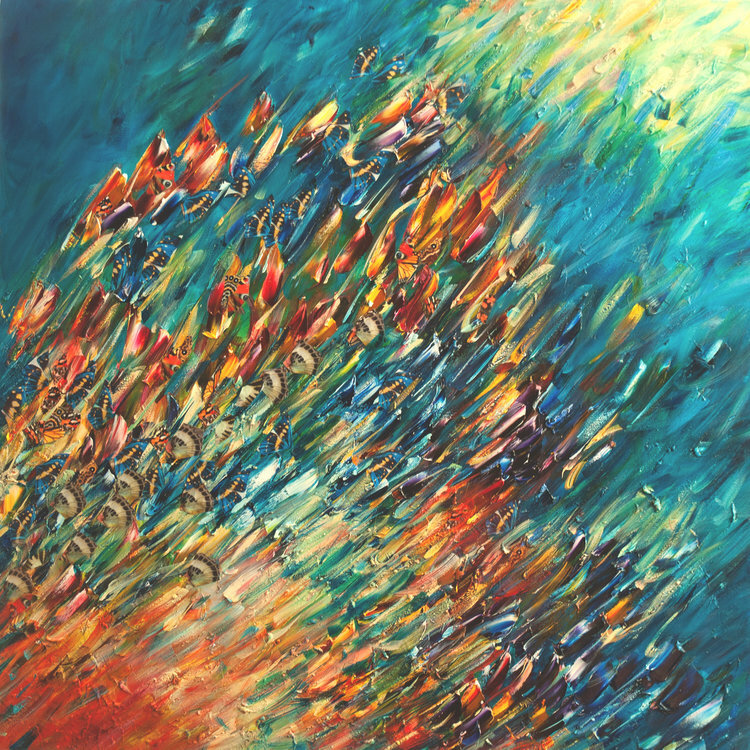 Victoria Horkan ‘The Peacock Parade,’ 2018, 102x102cm, Oil on canvas. Thank you, Victoria! Discover her full artist page and available works.